Dr. Rick considered a career in preventative medicine and one that combined traditional and alternative medicine. Because this type of practice involved using drugs he choose chiropractic and went on to get his Doctor of Chiropractic degree from Life West Chiropractic College. While there, he enjoyed learning about how the body works. Dr. Rick also became interested in pursuing a way to enhance the body’s ability to heal itself. He particularly enjoyed all the classes that dealt with anatomy, physiology and biomechanics. Dr. Rick’s grandmother played a key role in connecting him with one of his fellow chiropractors. His grandma was a patient of Dr. Cliff‘s when Dr. Rick was still in school. “She kept telling me about this great guy who she was getting adjusted by and how when I finished school, I needed to come work with him.” So one day the doctors met and they determined that working together would be a perfect fit. Dr. Rick loves Family First Chiropractic’s genuine family-like atmosphere for both the team and the patients. “I’ve never been at a workplace where everyone loves coming to work every day so much. Every patient sees how happy everybody is when they come here.” Dr. Rick and the rest of the team strive to make their patients’ days a little better. 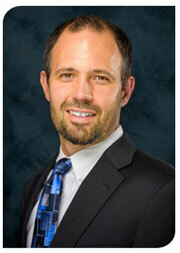 Dr. Rick enjoys hiking, golfing and most importantly, spending time with his family. He has a wife and four children. Dr. Rick is also involved with numerous community organizations including Children’s Cabinet and a local shelter for battered women. He is also pursuing stem cell research to help support the family of one of his young patients who has experienced some difficulties. Find out how Dr. Rick can help you and your family. Call 775 337 0184 to schedule a no-obligation consultation.